Maler, Graphiker und Bildhauer (1891–1976). 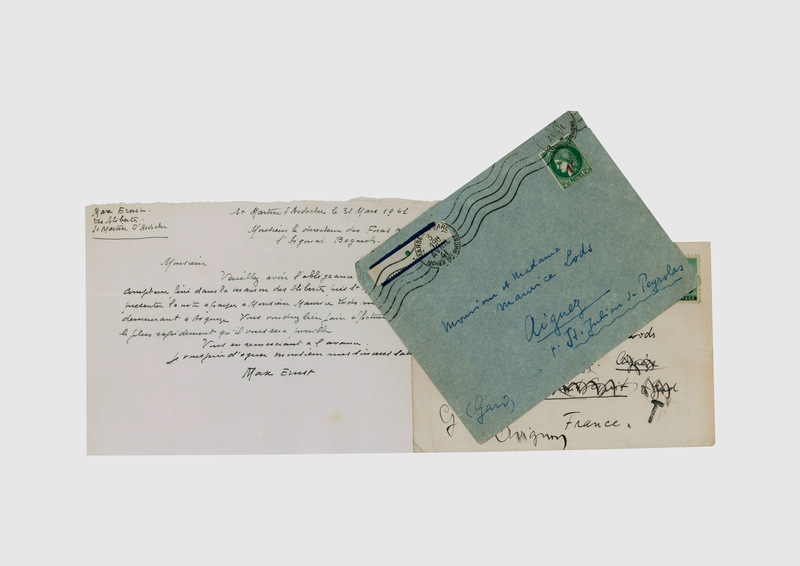 Collection of partly autograph documents and other material. Verschiedene Orte. Zusammen 47 Bll. Verschiedene Formate. Most of the material relates to the sale of Ernst’s residency at Saint-Martin d’Ardèche in Southern France, where Ernst and Leonora Carrington (the British-born Mexican surrealist painter and novelist whom he had met in 1937) had lived from 1938 to 1941. The interior that both had created for their house was widely renowned as a masterpiece of materialized surrealist imagination (cf. Spies/Metken IV, p. VI). Due to the stress of circumstances (Ernst fled from German-occupied Europe in 1941), the sale was somewhat hasty, and the house was left as well as its whole inventory and decoration (cf. 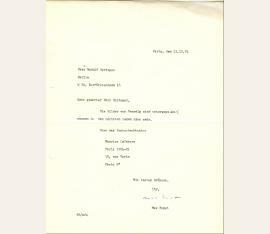 catalogue of works, Spies/Metken, nos. 2304 ff.). 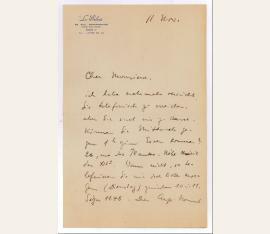 – The present collection comprises letters from Ernst’s lawyer, inventories, a letter from Ernst wherein he cancels the electricity supply, a letter from the essayist Leon Kochnitzky (1892–1965) to Ernst, alarming him that the Germans had sequestrated three of his works at his Paris residency, 2 autogr. 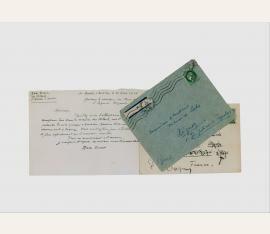 envelops, various letters and newspaper clippings, a photography, etc..
Maler (1891-1976). Autograph dedication signed. 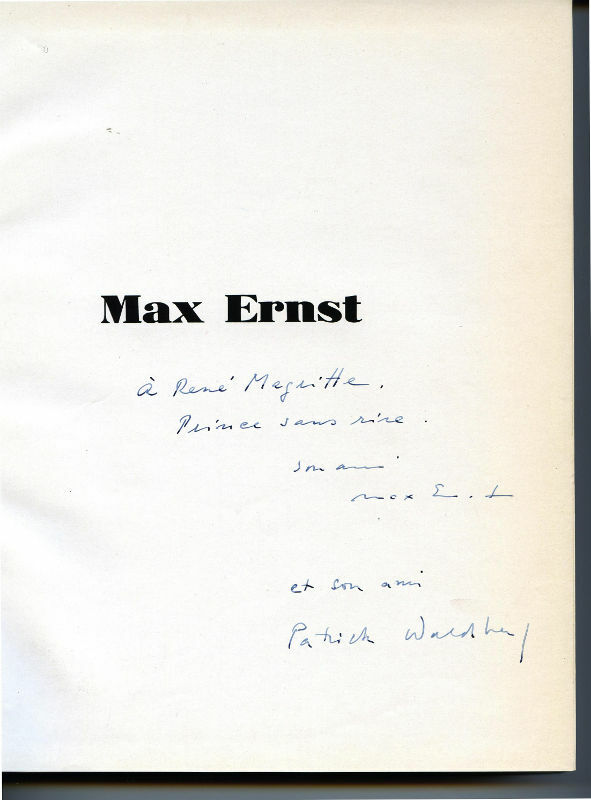 In: Patrick Waldberg: Max Ernst. (Paris). 443, (5) SS. 4to. Leinen mit blindgepr. Rücken- und Deckeltitel. "À René Margritte. Prince san rire. | son ami | Max Ernst". 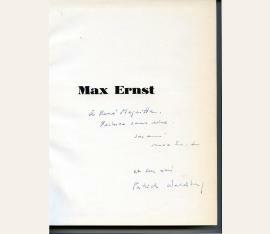 Together with another dedication signed by Patrick Waldberg. Maler (1891-1976). Autograph letter signed. Wohl Paris. 1½ SS. auf Doppelblatt. Gr.-8vo. Mit eh. adr. Kuvert. 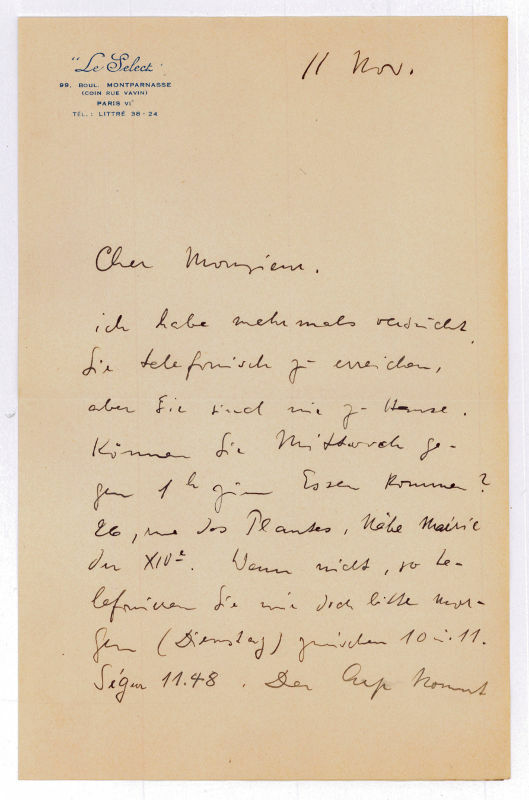 To the painter, art critic and writer Walter Kern (1898-1966), inviting him to lunch, and remarking that Hans Arp will come, too. - On stationery with printed letterhead of the hotel "Le Select". Max Ernst (1891-1976), Maler. Brief m. e. U., Paris, 13. Dezember 1954, 1 Seite gr.-4°. Gelocht. An den Kunsthändler Rudolf Springer in Berlin. „[…] Die Bilder von Venedig sind unterwegs und müssen in den nächsten tagen hier sein […]“ – Mit mehreren e. Korrekturen Ernsts.